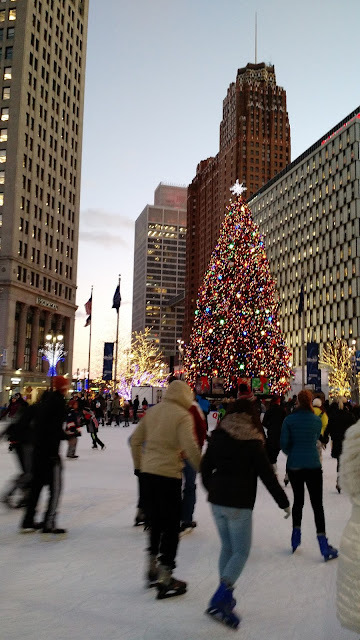 When asked where to escape for an overnight stay or a weekend, many Metro Detroiters probably would mention ski trips to Northern Michigan, a cottage on a lake, or even a weekend in Chicago or Toronto. When faced with the need to get away for a night, my wife, Allison, and I chose to stay closer to home and spend a weekend in Detroit. 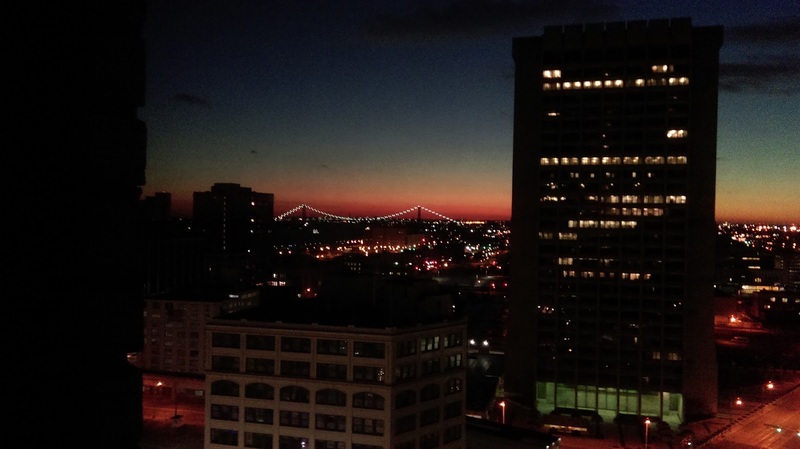 Detroit is ever-changing, and though we try to visit the city as often as possible, we still cannot find the time to do everything we want to in this burgeoning town. We only could get away for one night in December, but we wanted to make the most of our time in the city. First, we wanted to give a little bit back to the city, so we arrived early on a Saturday morning to volunteer with the Cass Community Social Services, through a volunteer event organized by the University of Michigan Club of Greater Detroit. Cass Community Social Services provides food, housing, and health services as well as job programs to Detroiters. Our job involved building door mats out of recycled tires. The mat program employs formerly homeless Detroit residents, and also uses the services of volunteers. Along with the mats, they sell other products including Detroit Treads sandals made from discarded tires and coasters. After a morning making mats for the program, we visited the organization's store and walked out with two door mats, and two pairs of sandals. After we finished working, we decided to head to Batch Brewing Company for lunch, but as we were driving there we saw Mudgie's Deli, a restaurant in Corktown I had always wanted to try. Since I had eaten at Batch before, we made a quick change of plans. 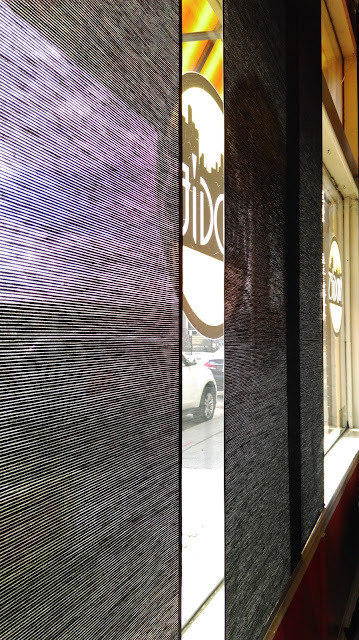 Since it was only a little after noon on a Saturday, Mudgie's was not crowded and we did not have to wait for a table. We were lucky we arrived when we did because the restaurant was packed by the time we were finished eating. Mudgie's has a huge menu, so I chose one of the waiter's recommendations, the Gracie. 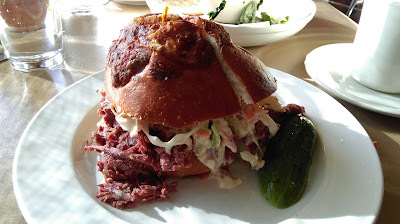 The Gracie has corned beef, blue cheese, barbecue sauce, and coleslaw, on an onion roll. The waiter did not fail me with this recommendation. I was a little skeptical about the barbecue sauce and blue cheese drowning out the other flavors, but the kitchen did not smother it in the sauce or cheese. The muted flavor of the barbecue sauce and blue cheese added just enough kick to the sandwich without overpowering the corned beef and slaw. Allison ordered the Veggie Reuben (grilled tempeh with swiss cheese, sauerkraut from Ann Arbor's The Brinery, and Thousand Island dressing on grilled rye). Tempeh is not my favorite food (I call bad tempeh "alien meat" because it is rubbery and does not taste native to Earth), but the tempeh was not rubbery and had a decent taste, making for a very good sandwich. We left the restaurant satisfied, knowing tha Mudgie's is definitely on the list for another visit. Since Batch Brewing was our original destination and Allison had not been there before, we stopped in to have a beer after finishing our meal at Mudgie's. As a beer lover, I can say that Batch Brewing is a must-visit for any Michigan beer lover. 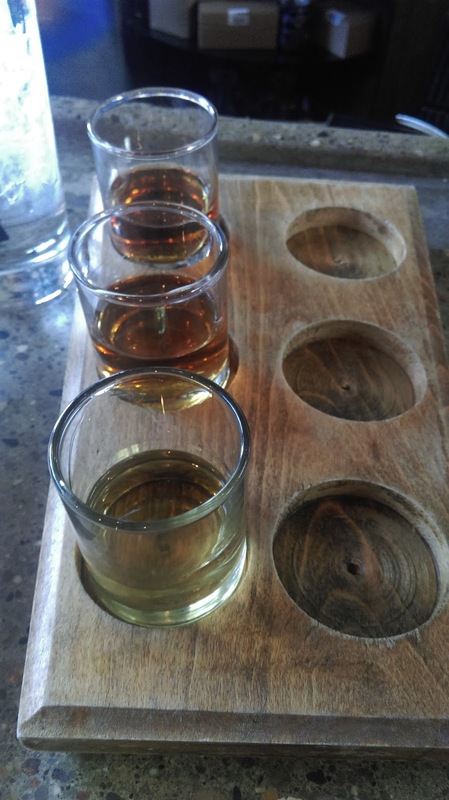 I have only visited a couple of times but am impressed with their beer, food, and knowledgeable and friendly staff. The bartenders and brewers are always willing to strike up a conversation and are clearly enthusiastic about their product. 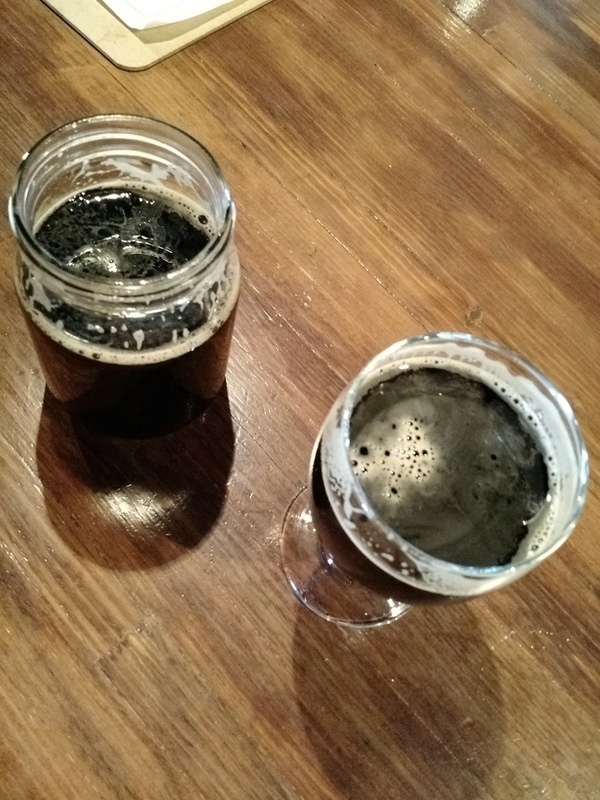 On this visit, we learned from two different staff members that their black IPA was the product of a fortunate accident during the brewing process and that they soon would be distributing the black IPA in kegs. On this visit, I had the Wheated Stout, and Allison ordered the Low End Theory black IPA. I loved both beers, but the black IPA was outstanding. We even stopped at Batch Brewing on the way out of town on Sunday to pick up a couple of forty-ounce bottles of this excellent brew. Although we had just stuffed ourselves at Mudgie's, I had to try something from their kitchen and ordered the Batched Pretzels. These house-baked delights are served with a spicy mustard and a muenster fondue. The mustard was good, but I wanted to eat a bowl of the fondue with a spoon. 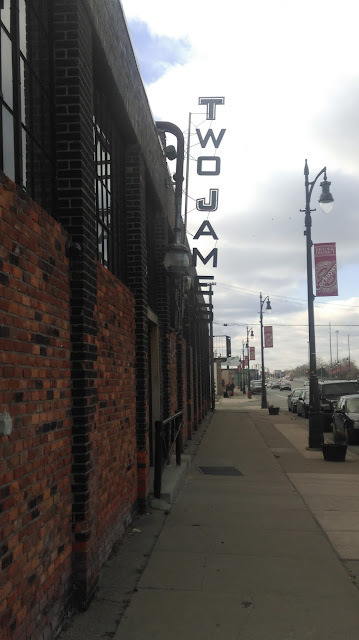 Our final stop in Corktown was Two James Spirits, the first licensed distillery in Detroit since Prohibition. 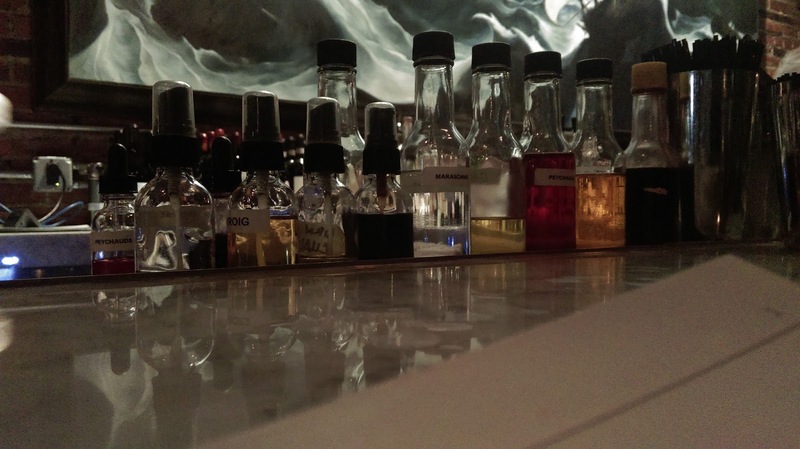 I am a recent convert to Michigan's growing craft distillery scene and had tried a few mixed drinks with Two James vodka or gin. Having never tried their spirits straight, I ordered a three-spirit tasting flight with the Barrel Reserve Old Cockney Gin, the Grass Widow Bourbon, and the Johnny Smoking Gun Whiskey. 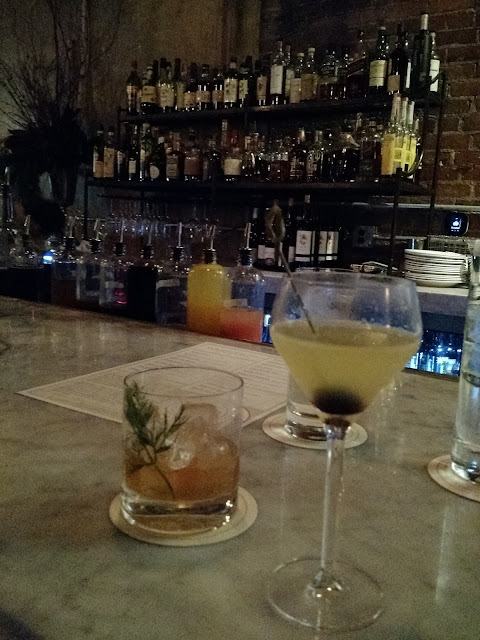 I am partial to gin and bourbon and enjoyed the Old Cockney and Grass Widow, but I was surprised to find the Johnny Smoking Gun was my favorite of the three. The aroma of the whiskey lured me in, and the taste hooked me. I purchased a bottle to go. Allison ordered a Sour Orchard (Old Cockney Gin, fresh lemon juice, sage, red delicious apple, and simple syrup) that she thought was delicious. The cocktail menu looked enticing, but we knew we would be going out later and cut ourselves off at one round. After our brief tour of Corktown, we checked into the Westin Book Cadillac Hotel downtown. First opened in 1924, the Book Cadillac is in the heart of downtown with the iconic Lafayette and American coney island restaurants practically across the street and Campus Martius only a couple of blocks away. The hotel feels modern but is full of history. 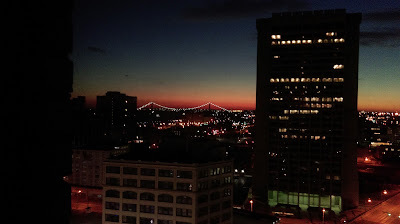 Our room's view included the Detroit River and the Ambassador Bridge in the distance. 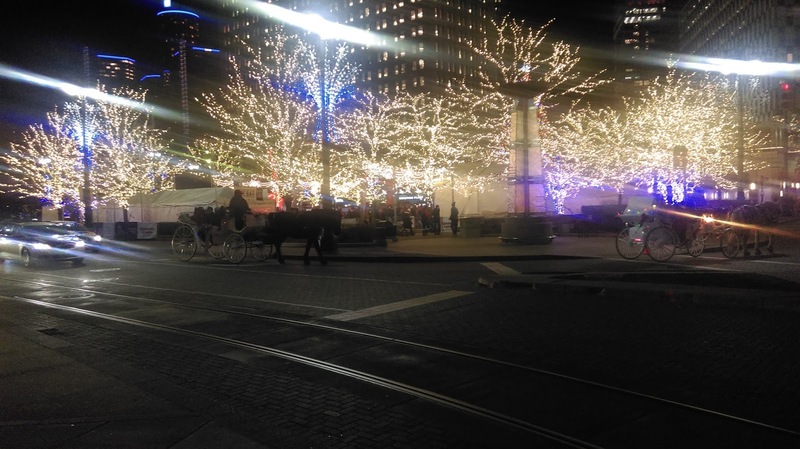 After settling in, we walked to Campus Martius to soak in the holiday spirit of Downtown Detroit. We skated on the ice rink to Christmas tunes as the day turned to night and watched the glow of Christmas lights replace the sun's light. Campus Martius is the heart of downtown, and on a cold Saturday night in December I could feel the energy and warmth of a city through smiling teenagers, families posing for photos, and little kids zooming around less advanced skaters like me. Detroit has been knocked down and pushed around, but I could feel its heart beating, and the beat is getting louder. After skating, we went back to the hotel and changed into nicer clothes for our dinner at Wright & Company. 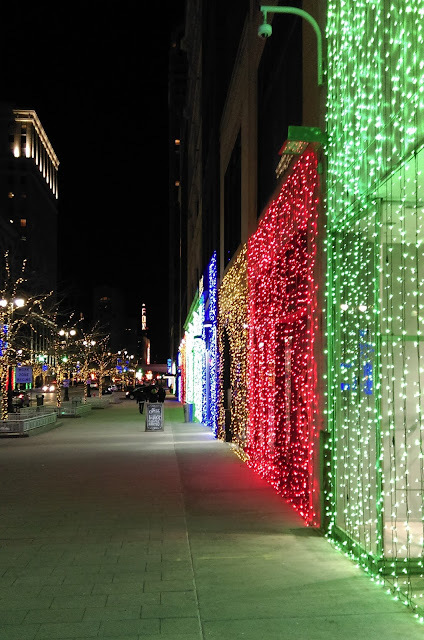 We walked down Woodward Avenue and enjoyed the multicolored lights covering the storefronts along the avenue. Wright & Company does not take reservations, but we thought we would be safe arriving at 6:00 p.m. on the Saturday before Christmas. Instead, we found ourselves facing an hour wait and a bar known for its mixed drinks. Not a bad situation. After a two-cocktail wait, our number came up and we took our seats. Wright & Company serves small plates, kind of like non-Spanish tapas, allowing diners to explore many corners of the menu. And every corner of the menu we visited delivered. The potato chips with cheddar, bacon, and scallions, the charcuterie and cheese platter, the tuna tartare, and the crab and avocado toast were phenomenal. But I fell in love with the braised ox tail and gnocchi dish. I devoured everything that came to our table, until I tasted the ox tail. I let the ox tail sit in my mouth so I could savor every morsel and had sucked every last flavor from it. After our dinner, we thought of wandering around to other bars, but we decided to head back to Roast at our hotel for a nightcap and dessert. We ordered the heavenly "I'm Your Huckleberry" dessert, a chocolate almond cake with huckleberry ice cream, before retiring to our room for the night. The next morning, we ate breakfast at the hotel's Boulevard Room restaurant before checking out. On our way out of town we stopped at Batch Brewing to get the bottles of the black IPA and at the Detroit Institute of Bagels to get a dozen of my favorite bagels to go. 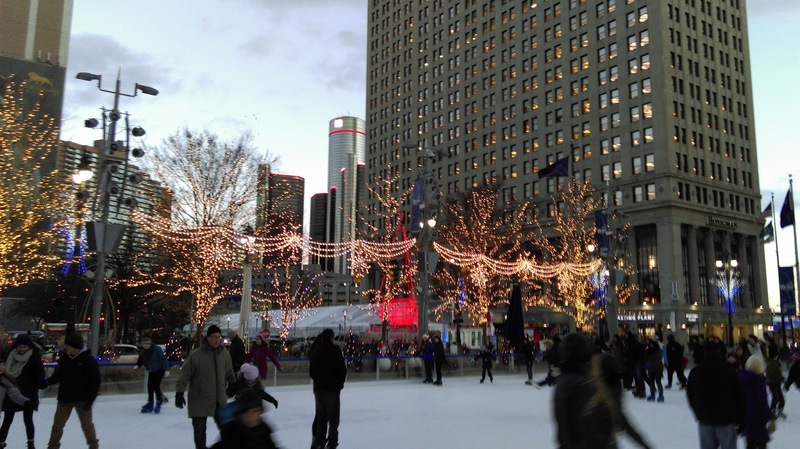 Our 24 hours in Detroit is a minuscule sampling of a city full of life. We didn't see any of the museums, theaters, music venues, building tours, and shopping that the city offers. Every day, something new is added to the patchwork growth of this city. I cannot wait to continue my discovery of Detroit.